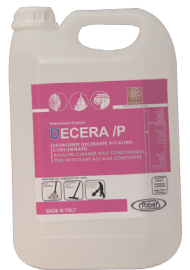 DECERA/P is a specific alkaline based detergent for effectively removing, de waxing or loosing stubborn ingrain dirt or previously applied synthetic or organic waxes and surface oil/grease marks. DECERA/P removes completely all surface dirt preparing the floor for eventual new treatments. 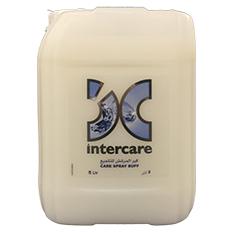 Highly recommended for removing light cement residues on surfaces where an acidic based detergent cannot be used. Use product diluted. DILUTION: based on the material and degree of dirt residue, dilute from 1:4 to 1:1 in warm water. 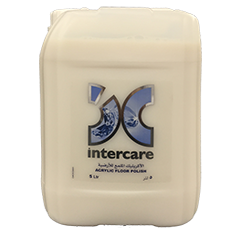 (on ceramic or polished surfaces dilute 1:10; terracotta or rough surfaces 1:1) Apply directly to the surface and allow a contact time of a few minutes before proceeding to scrub manually or using a scrubber and nylon pad until all residue is dissolved. Add water and remove all residues using a wet vacuum. Rinse until all residue is removed.